Heat oven to 375°F. On cutting board sprinkled with 1 1/2 tablespoons of the sugar, separate dough into 4 rectangles; firmly press perforations to seal. Lightly press dough into sugar. Brush rectangles with about 1 tablespoon of the melted butter; sprinkle with remaining sugar. Using 2 rectangles, place one rectangle on top of the other. Starting with the shortest sides, roll up both ends jelly-roll fashion to meet in center. Cut into 8 slices. Repeat with remaining 2 rectangles, forming 16 slices in all. Place, cut side down, 2 inches apart on ungreased cookie sheets. Brush with remaining melted butter. Bake 10 to 13 minutes or until golden brown. Gently recoil cookie if necessary. Immediately remove from cookie sheets. Cool completely. Place cookies on serving plate. Place dollop of cream cheese spread on each cookie. 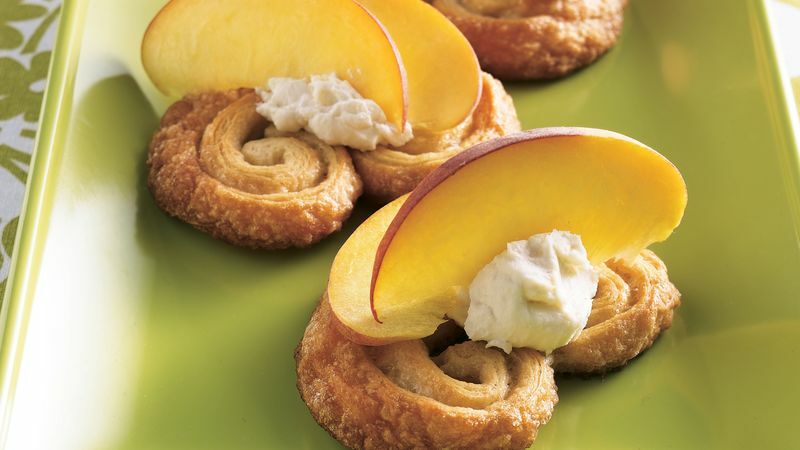 Top each with sliced peaches. Palmiers, so named because they form a palm leaf shape as the pastry puffs out, can be made the day before, then assemble before serving. Frozen or canned peaches can be substituted; plan on about 11 ounces.